With over 30 years in the industry, USA Phone has been providing the highest quality, cost-effective VoIP tools to businesses & organizations helping to take the stress out of communication. The Most Cost Efficient VoIP Phone Systems. Period. USA Phone provides award winning Cloud-Based Telephone Services, Business Phone Systems, VoIP Phones and Hosted PBX’s to businesses in both Small to Mid-Sized Businesses and Enterprise Level Markets. As a VoIP SIP Service Provider, USA Phone begins with a complimentary customer ROI Review to determine a client’s current voice / data operating costs, service configurations and requirements. The company then prepares a plan that will reduce costs, improve all services by removing old technology while upgrading to new and improved cost efficient technology and phones. USA Phone offers VoIP Service with the most Features and the Lowest Cost. With each new client, we provide a comprehensive analysis of your existing phone system and show you how we can save you money. 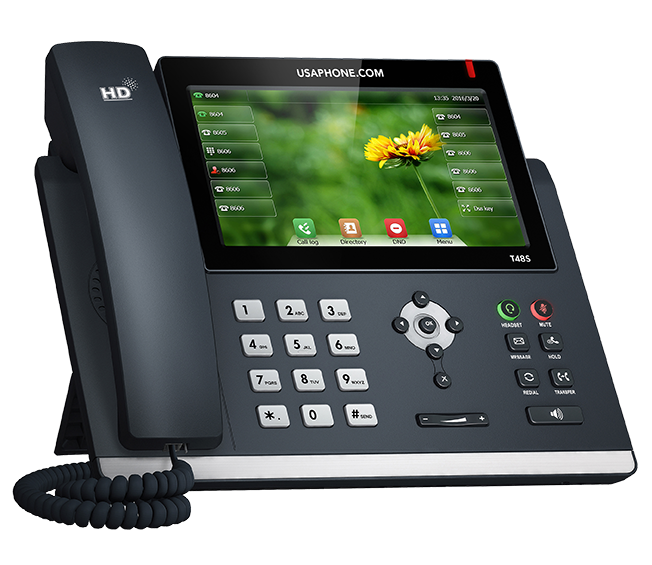 USA Phone's VoIP Phone Systems helps you to stay connected to your customers and staff anywhere in the world where internet service is available. Our VoIP Service comes with a Failover Redundancy feature ensuring your phone service is working 24x7 while delivering optimal digital call quality. We use products from manufactures that are on the leading-edge of technology in order to provide the best user experience in communication. Log into our VoIP Service Portal from anywhere and have complete control over all of the features that allow you to customize your experience to your needs. With a Premise Based Phone System, it is regarded as the "standard" in business communication and is revolutionizing the way business communicates. USA Phone provides Award Winning PBX Phone Systems & VoIP Service with the most advanced benefits & features at the lowest cost to businesses in both the Small to Mid-sized Business and Enterprise Levels. We always begin with a complimentary customer Return On Investment Analysis Review to determine a client’s current voice & data operating costs, service configurations and requirements. We then prepare a plan that will reduce costs by removing non-essential services while upgrading our clients to new and improved cost efficient technology and phones. We have USAPhone.com Hosted IP Solutions at 6 of our locations. We love the benefits, features & functionality of VoIP Service and plus we saved $140,000.00 over 3 Years – Excellent. After a review of our current Carrier, Internet Services & Desktop Phone requirements, we discovered that we could network all of our 12 sites with inner office communications, get new phones and lower our overall costs by $150,000.00 a year. We now have a much improved calling experience for both our clients & employees. To say I am satisfied is an understatement. It was a great move on our part to go with the Hosted IP Solution from USAPhone.com. Our outdated phone system needed its own pain management. We are very satisfied with our decision to convert to USAPhone.com’s Hosted IP Phone Solution. The conversion was easy with no downtime. We have experienced great customer service and support and I am very pleased with the $48,000.00 we will save over the next 3 years. After a review of our current phone & data requirements, we discovered that we could network our 3 sites with inner office communications, get new phones and not increase our current monthly cost. We are very satisfied with our decision to convert to VoIP Service with USAPhone.com. USA Phone.com went above & beyond our expectations. They were there every step of the way during the construction to the installation of the VoIP Phone System prior to us moving into our new location. I am very satisfied at how easy all aspects of the conversion & installation of services came together. The Township Office, Police & Fire Departments are so pleased the decision to convert to USAPhone.com’s Hosted Enterprise IP Phone Solution. The Single Point of Management for all of our VoIP & Carrier Services is a welcome change from what we had prior to the conversion. We now have the ability to better manage all of our day to day operations & we saved over $9,500.00 over 3 years. We’ve been local to Southern New Jersey for over 30 years, but that hasn’t stop us from helping businesses, Non-Profits, Educational Institutions, and Local Governments outside of the state realize the benefits of VoIP Technology. Give us a call at 856-761-1000 or stop by and say hello!